It's a paperless world nowadays, as our card-filled wallets prove, and for good reason. Proud owners of ANZ, BCA, Union, UOB and many other bank cards can enjoy many benefits like 50% off bill. 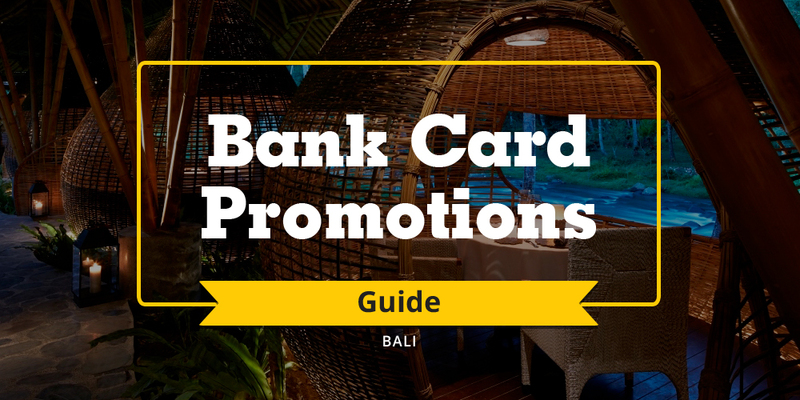 Over 30 top restaurants to choose from and up to half the expense, these bank card exclusives are the real deal! *Updated as of 1 September 2017. This offer is not valid in conjunction with ongoing promotions, offers, on the eve of, and on public holidays, unless otherwise stated. Limited to single redemption per table, per bill unless otherwise stated. Please check specific terms and conditions of each offer as to which specific bank cards are eligible. Enjoy 15% off the À la carte (food) menu at Layang-Layang & Nyala Beach Club & Grill. Enjoy 10% off from the special events (food only) for Balinese Night and Sunday Lobster Brunch at Layang-Layang Restaurant & Tuesday Barbeque at Nyala Beach Club & Grill). Enjoy 10% off the beverage À la carte bill at Layang-Layang and Nyala Beach Club & Grill. Enjoy *15% off the bill at RIN for BCA credit card holders. *Valid until 31 October 2018. Enjoy 15% off the food bill for Danamon cardholder (terms & conditions apply). Enjoy 15% off the food bill & Come 3 Pay 2 for Sunday Beach & BBQ Brunch for BCA cardholder (terms & conditions apply). Enjoy 15% off the food bill for BCA cardholder (terms & conditions apply). Enjoy 20% off the food and beverages bill for using Union Pay card. Enjoy 10% off the food bill for using Citibank card. Save 15% off on food only for Danamon card holder. Save 15% off on food only for Citibank card holder. AMEX credit card entitled for 15% discount for food and non-alcohol beverages apply in Folk Pool & Gardens. Enjoy 20% off the bill. Enjoy 20% off on Food only for using Amex card (For Dine in only, min IDR 150,000 exclude tax & service). Enjoy 20% on Food only for using Mandiri card (For Dine in only, min IDR 150,000 exclude tax & service). Enjoy 20% on lunch and dinner for using UnionPay card (Discount applies to food only. Subject to minimum transaction IDR 100.000, before service charge and taxes. Not valid on public holidays). Enjoy 20% off food bill. 4-course Signature Menu Enjoy special signature menu from Spice by Chris Salans, the 4-course set menu available at only IDR 275,000++. Enjoy the best sellers menu from Spice by Chris Salans, the 4-course set menu available at only IDR 195,000++. 10% off the food bill (drinks not included) for UnionPay Cardholders when spending IDR 300,000 or more on your bill. 10% off the bill for Kawan Lama, Informa, Toys Kingdom, Chatime members. Simply show your membership card to enjoy this discount.